They are a common sight. Often found in gardens and roadside ditches, the Magpie is a highly interesting and supremely intelligent bird. 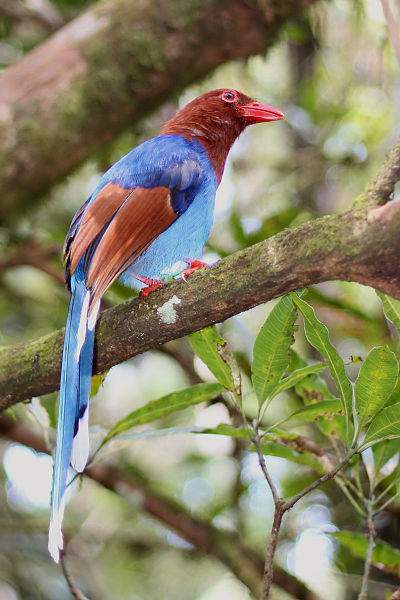 The embodiment of ‘can-do’, they are perhaps the most adaptable of all avian species. Magpies have always been held out as fascinating animals by humans. Steeped in folklore and myth, the magpie has become synonymous with thievery and the acquisition of bright, shiny objects. 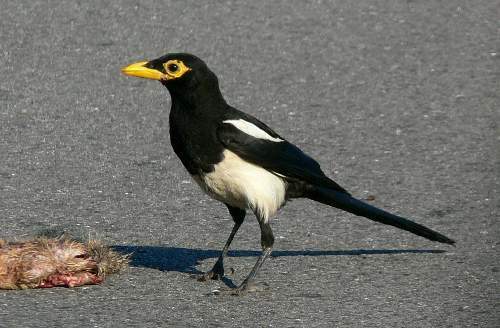 Magpies, noted for their scavenging, are unsurprisingly omnivorous. They will eat almost anything edible. They have even been documented eating the young of other birds. The black and white coloured European Magpie is both territorial and monogamous. They can lay as many as nine or even ten eggs in a nest. Interestingly, only one brood is usually reared with the exception of tragedy befalling them. Like many birds, the European Magpie likes to select tall trees to build its nest in safety. Their nests are often huge twig and clay structures measuring up to 3 metres (10 feet) across. The European Magpie is able to recognise itself in a mirror. To date, this is the only known animal other than mammals to do so. Helmut Prior, a psychologist, conducted a experiment in which coloured markings were painted onto the magpie. These markings could only be seen in a mirror by the magpie. Once the magpie noticed the markings he tried to reach them with its claws and beak rather than trying to hit the mirror. Man places huge emphasis upon self-recognition as an important test of intelligence. Magpies have relatively large brains in comparison to other birds. Their large brain-to-body ratio may explain how they, unlike other birds, can recognise themselves. The European Magpie has a myriad of superstitions attached to it. Connotations of ill-luck, malady, misfortune and thievery are all associated with it. There is a tradition in Scotland of a magpie being present on the window of a house, foreshadowing the death of one of the house’s occupants. The Magpie is seen in many European countries as being a thief that steals anything bright and shiny including watches and jewellery. The Norwegians seem to take an ambivalent approach with the Magpie. In Norway, like the rest of Europe, the bird is thought to be the embodiment of thievery and trickery, but on the positive side it is also associated with good weather. The Magpie has left so much of an impression upon people that it even has a rhyme dedicated to it. 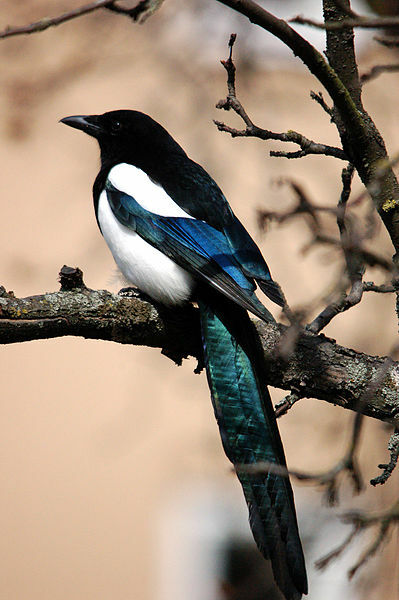 The Black-billed Magpie (Pica hudsonia) is a close relative of the European Magpie. One of the larger species of magpie, the bird can be over half a metre (23 inches) in length. 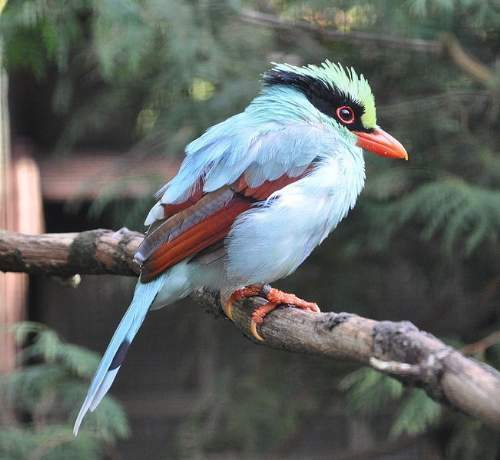 The bird is found on the Western side of North America from Alaska all the way down to New Mexico. The Black-Billed Magpie is slightly more colourful than the European Magpie with larger areas of blue-green coloured feathers. The male is larger and heavier than the female. 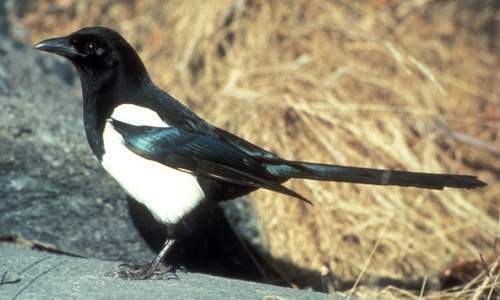 The Black-Billed Magpie is regarded as almost tame in many areas where they are not hunted. However, in areas in which they are still stalked they are unsurprisingly reticent. The magpie has had a troubled past when it has come into contact with people. In the early 20th century, the bird found itself being culled as it was thought to be reducing game-bird numbers. The Yellow-billed Magpie (Pica nuttalli), which this website is named after, is almost an identical twin of the Black-Billed Magpie apart from it’s yellow beak. It has one of the shortest ranges of all the Magpie species and is found only in California. The Yellow-Billed Magpie is considered to be one of the most attractive of all the magpies amongst birdwatchers. Fossil evidence suggests that the Yellow-billed Magpie become separated from other magpie species 3 or 4 million years ago. The period of isolation was long enough to prevent inter-species reproduction. Interestingly, when a Yellow-Billed magpie dies other members of the flock exhibit mourning-like behaviour. This consists of other magpies flying towards the dead bird and emitting loud squawks for a sustained period of time. The makes it part of a highly select group of animals, which includes humans. People still find magpies to be one of the most curious birds. Although clouded in superstition and myth, the magpie’s intelligence and keen eye for pretty objects mean that our curiosity is unlikely to diminish any time soon. Magpies vary in height according to the species. The European Magpie (Pica pica) can be up to 50 cm (20 inches) in length. Magpies can weigh over 2 kg (5 lbs). Some magpies have been known to live over 30 years. They are found in nearly all continents with the exception of Antarctica. Australian Magpie: Biology and Behavior of an Unusual Songbird charts the strained relationship between magpies and humans in Australia. The book contains much of what is currently known about the Magpie and is highly recommended both for this and its unusual perspective. For people living in Ireland or the United Kingdom, you can access Australian Magpie: Biology and Behaviour of an Unusual Songbird here. For those who live in Canada, you can obtain Australian Magpie: Biology and Behaviour of an Unusual Songbird from here. For Germany: Australian Magpie: Biology and Behaviour of an Unusual Songbird. For France: Australian Magpie: Biology and Behaviour of an Unusual Songbird. Never seen these coin collectors before. That is pretty cool though. In the midlands there seems to be a custom called ‘saluting the magpie’ ; also of addressing it as ‘your honour’ ; in Lichfield they have a rhyme (not the “one for sorrow ” one) with which to greet a magpie. Brewer’s dictionary of Phrase and Fable gives a variant on the ‘one for sorrow’ rhyme beginning ‘one’s sorrow, two’s mirth/one’s a christening ,two’s a birth’ etc up to nine. Thanks for your comment, Brigid. It is amazing how much folklore the magpie has created. Stop by again! Interesting… What I have always wondered is WHY? Even being omnivorous, like humans, they can hardly want to eat gold, watches, etc. nor use them in nest building… They’re known for simply dropping the objects again, especially if too heavy. But WHY the attraction, there must be a reason, espcially since they are such intelligent birds. Thanks for your interesting comment, Deb. Any answer would of course be complete speculation. Perhaps they like them for the same reasons we do. We are attracted to their bright allure and we also deem them valuable. Maybe they do the same.